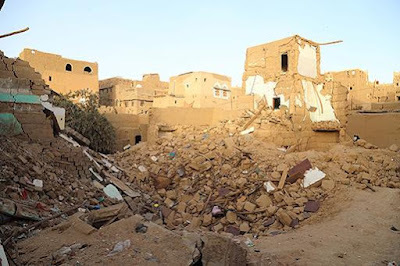 In the early hours of April 15, an airstrike hit a residential house in northwest Saada City, killing four people, a woman and her three children, and wounding three to five people, including two children. "I heard a plane overhead, and then this loud explosion. I looked out of the window, which had shattered with the explosion, and saw Ahsen jumping out of the window of the second floor of the house, clutching his 10-year-old son. I wanted to run outside but was scared that the aircraft might strike us again if we gathered outside." After 20 minutes, Qamis felt that it was safe enough to run outside to help the family. Qamis said that the attack killed al-Sabra’s wife and three of his children. A local resident gave Human Rights Watch photos that included one of the destroyed al-Sabra house and several showing three children who appear under the age of 10 lying, apparently lifeless, on the floor. One photo shows what appears to be a covered, larger body lying next to the children. Al-Jumhouri hospital records show that three people from the al-Sabra family, including two boys, ages 10 and 12, received treatment at the hospital on April 18. Qamis said that the attack also wounded al-Sabra’s pregnant daughter and a woman in a neighboring house. The Ansar Allah list does not contain information about any Houthi casualties from this attack. Human Rights Watch visited the impact site on May 15. The strike appeared to have destroyed a significant part of the al-Sabra house and caused damage to two adjacent houses. Bricks and other debris from the house partially filled a large crater in front of the house, about three meters in diameter. Human Rights Watch was not able to identify any potential military targets in the vicinity and did not see any remnants to help identify the type of weapon used.